Travelling is fun, costs money, time and kerosine, if you plan to go long distance. That’s why I like to travell virtually, via Google Earth. To make things more exciting, I let chance be my travel companion. 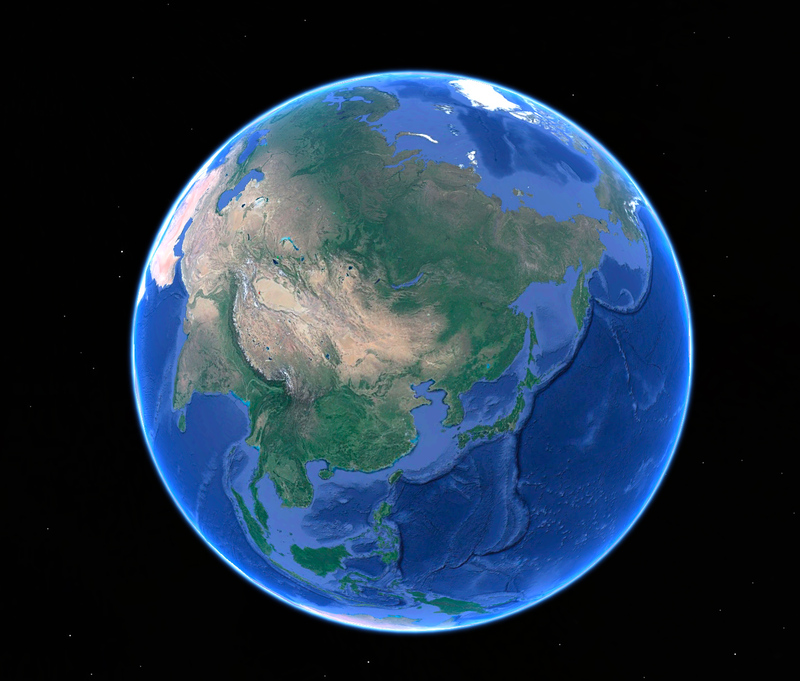 Using Google Earth, I zoom out so I can see the world in its completeness. Once the world is spinning, take your mouse to the middle of the screen, close your eyes and wait for your intuition to tell you to go for it: click, zoom in as close and possible, et voilà: you have reaches your destination! Open your eyes and start to explore your surroundings. Well, at least if you didn’t hit the sea, wich will happen 71 times out of 100 trials. Just start all over again until you hit ground. My first try ended up wet, but my second try is successful! Inner Mongolia, Gobi Desert. Luckily I land near a track north of the city of Erenhot. The Trans-Mongolian Railway passes the border between China and Mongolia. Here the bogies of the trains are changed, since Mongolian and Chinese rails have a different gauge. Dinosaur bones have been found in Erenhot causing a veritable dino-craze. The city is packed with models of these giant reptiles. The highlight: a bridge of two dinos kissing above a street (photo: Phil MacDonald). My advice: Go on your own virtual vacation with google earth! Take some screenshots and post them as postcards to your favorite platform. Add something about the place, invent some awesome memories of the place. Maybe it isn’t as cool as being there yourself, but it saves money and time and is good for the environment. 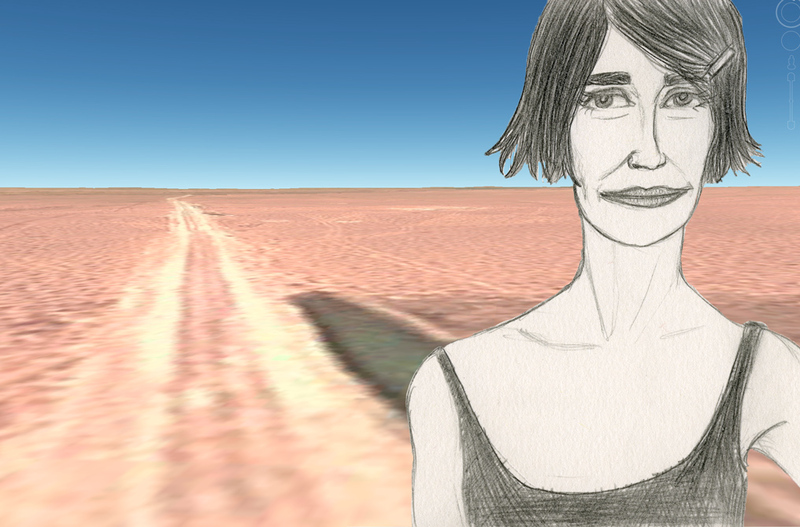 Being virtual has its advantages: I can wear any clothes my illustrator is able to draw. Each piece is unique. Fashion for tangible people can be custom as well, but that’s expensive. Individualized mass production is more then just an oxymoron. Designers are working for some time on the topic of mass customization. You can see it in all the configurators web shops have to offer, anything from cars to furniture. 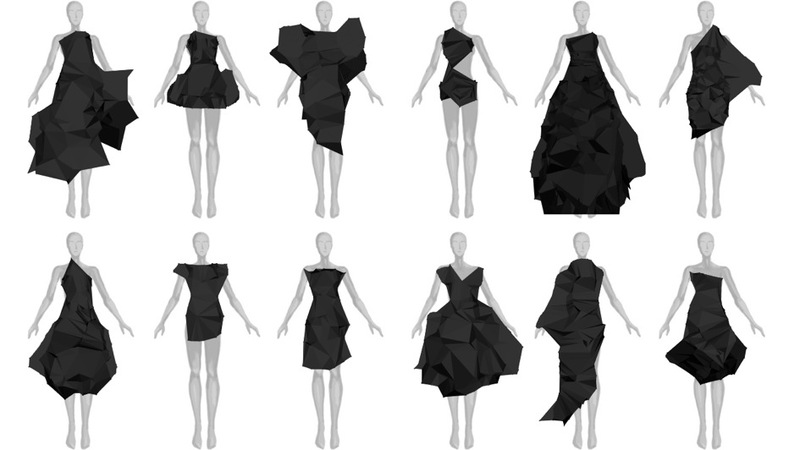 Fashion is still at an experimental stage, but I love experiments! One such experiment is conducted by Jenna Fizel and Mary Haung of Continuum Fashion from New York. 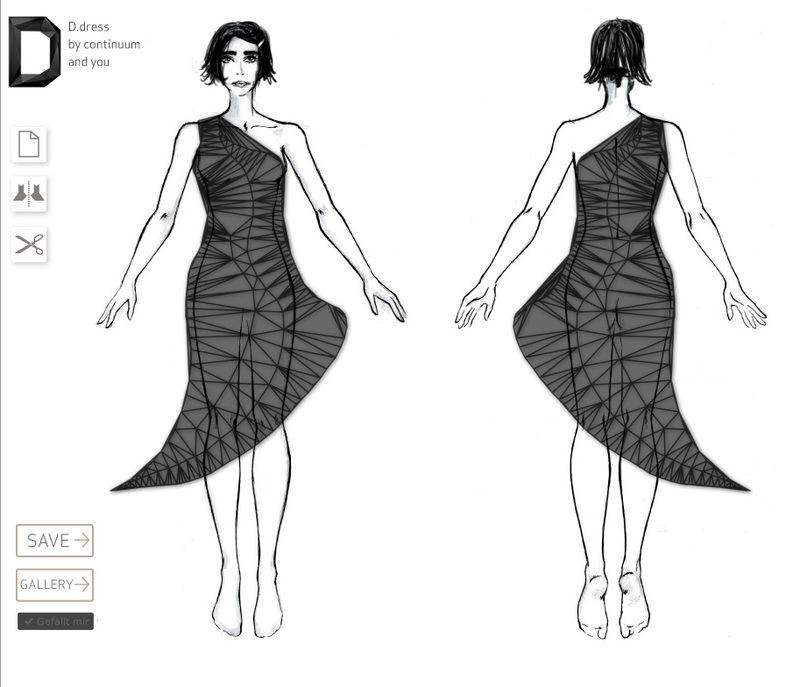 You can draw your dress on the screen. 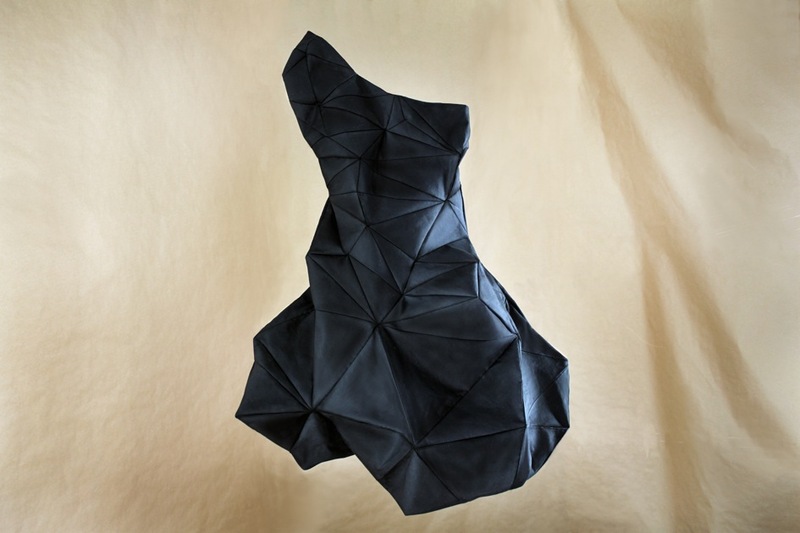 Your design is divided up into small triangles which are cut out by laser or plotter and sewn together for your self-designed, futuristic piece of couture. The designer sets the parameters and rules with which the customer can design something himself. The result is individual but still alike to other custom pieces. 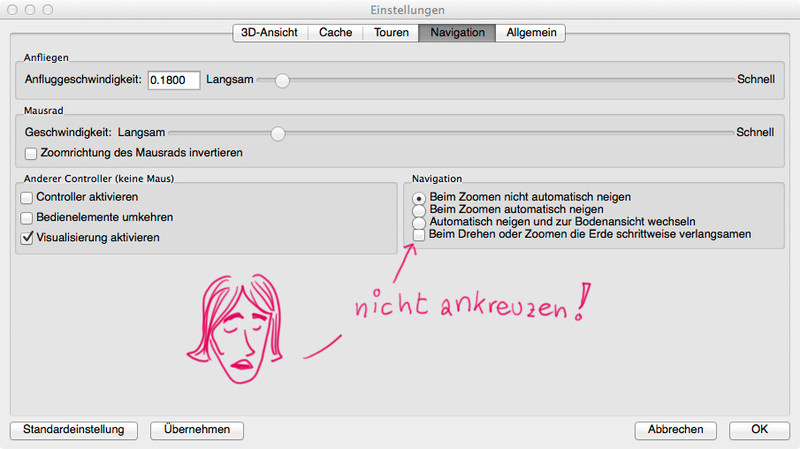 Designers who like to dictate every little detail in their work won’t like it. It is a great challenge to give away control of part of the process of design. It matches the way people define their identity between belonging to something and being individual at the same time. Not as individual, but manufactured futuristicaly: the N21 Bikini. It’s produced in one piece by a 3d-printer. The solid Nylon 12 it is made of is strong and flexible. The printing process is able to create structures impossible to be made out of thread. You can get your personal bikini produced at shapeways.com, but it’s still expensive. Individual production is smart. You don’t have to produce heaps of clothing in all sizes. You can produce on demand, piece by piece. I don’t want to know how many clothes never been worn go to waste each year. Besides reduced use of ressources another advantage is that you don’t need any large production sites. You can produce and deliver locally on demand. Short transit, low cost of storage and no child labor offer great advantages. These concepts are still in their early stages, but there is great potential. And in this case, they even look pretty hot! I am glad I can get myself drawn into these clothes. Thou shalt not eat a bar of chocolate bit by bit. Eat it in one bout. That’s one of the lesser known commandments. The odious habbit of saving the best for the end is not – I emphasize NOT – the road to salvation and happiness. Who knows for shure the end is really coming? Maybe you miss it? Notorious Joypostponers have their fridge packed with delicacies long past their expiration date. They start with the side dish and loose their appetite before reaching the filet. They work themselves to ruins and are not able to enjoy their pension anymore. They build their happiness upon anticipation. Grab your joy as long as it’s fresh. It is too ephemeral to store it frozen in Tupperware for days that may never come. And if it’s gone, new joy will come along anyway. It’s the same with ideas. Make them real before they fly away. Don’t put them in the big, crowded box of future projects. Ideas without implementation are worthless. Act now! Enjoy now! If anyone should ask about the soundtrack of my life, the answer would come rather easy. Since I discovered Stereolab in the mid-nineties only few days have passed without listening to them. Sounds weird, but let me explain: Stereolab has a magic ability, something like a super power. If I listen too much to one band, I get bored and need a listening-break. Not so with Stereolab. During their 19 year period of work they have filled about a foot of shelf space with discs, everything from hypnotic strumming guitars to experimental electronics. Within this broad bandwidth there is one constant: Laetita Sadier. The singer and texter is the cherry on the cake of the worlds greatest band. Her voice strides through lengths of different forms of beauty, her texts are intelligent and poetic. Besides Stereolab Laetitia had her own project: Monade. Similar direction, less complex, a bit rougher and more emotional. Another great band. 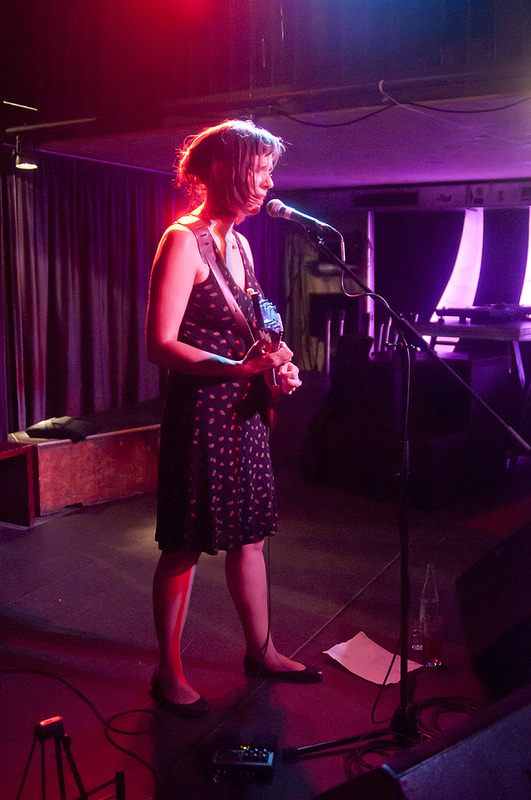 Stereolab and Monade are no more, Laetitia recorded a solo album and goes on stage on her own. For example in Stuttgart at Schocken, a renown venue for the local alternative scene. I don’t know if it’s the thunderstorms lurking in dark clouds on the horizon or just the fact that the week has just begun. Only 30 people are gathered at the venue when Laetita Sadier enters the sparsly decorated stage. A fender guitar amp, a microphone, one of those mulitfunctional electronic wonderboxes you can step upon, a setlist, a bottle of water and Laetita with her guitar. A Gibson SG, held the other way around. Stereolab made the stage look like a cramped music instrument dealership, Laetita travels lightly. She starts. And she starts to fight. With her first song (Fluid Sands). The song “does not want to be played tonight”, she explains after some futile attempts to get the right chords out of her guitar, which is just the side-dish to her magnificent voice. She plays songs of her new album and from Monade (Thank you for playing Wash and dance, your “angry” and my favorite song). The absence of other musicians which populate her albums bestows a different character upon her songs. Sometimes I miss something, other times things surface which enchant me entirely. Like her calm and serene charm. The boys in the audience fall into a deep trance, each of them utterly in love. If I would be one of them, I’d do the same. Laetitia could sing all night long for me. Time has left all meaning behind. But after two encores she leaves the stage, sells her discs, talks to the audience and leaves. I must be a weirdo: My personal “superstar” attracts only 30 people. But isn’t that wonderfull, on the other hand? Who can get so close to his or her idol? Go and buy her album „The Trip“! Thank you Laetitia for making my world sound better. I hope you’ll come back soon to mysterious Stuttgart with more songs. I’ll be there. 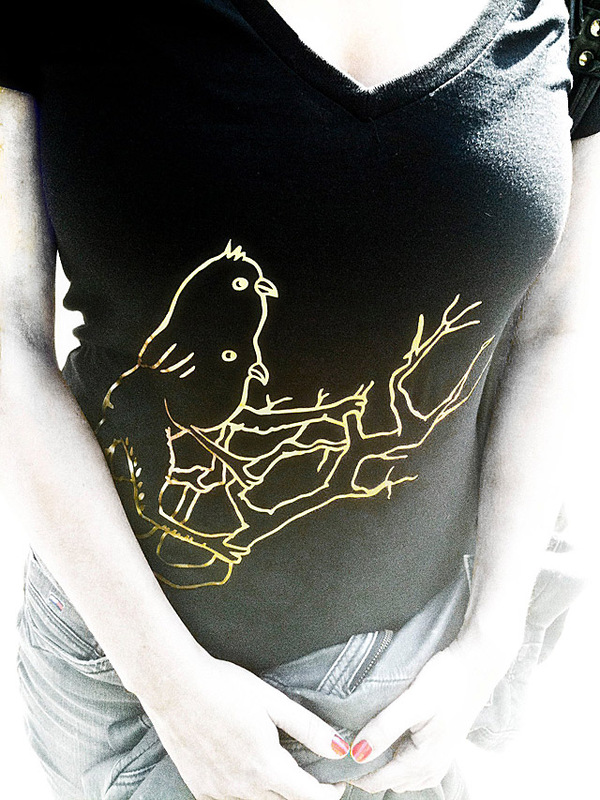 New Shirt: “Der goldene Vogel der Erkenntnis”. Sounds strange, even if translated: „The golden bird of Cognition“. It is inspired by Humberto Maturana and dedicated to Dagi, who taught me the technique of joy without reason. I am happy. For no reason. That’s just fine, since reasons can be pulled away beneath your feet like a carpet. There should only be reasons for unhappiness. You can get rid of them. Reason is overrated anyway, it won’t take you very far and it doesn’t promote happiness on its own. The search for reason behind the unreasonable is actually a source of constant frustration. Sometimes it’s just fine to let go and enjoy life as it comes. ITFS: Birdboy, eyeballs and lots of virtual blood. “The external world” , David o’Reilly won a lot of prizes. Lots of weirdness and digital blood, oldschool graphics, trashy rendered. A true digital Horrorland. In short: a great small film. Here you can see the whole movie: http://www.theexternalworld.com/. “Pixels”, Patrick Jean: 8-Bit attack on the tangible world, in this case New York. Guess who looses. “Nullarbor“, Alister Lockhart und Patrick Sarell: Two men, two cars and an endless desert road. They act like they all do: Showing off, nonverbal communication, breaking stuff etc. “Black Swan”, Guy Harlap: Lots of colors, shapes and patterns swirl to the beat of Thom Yorks Song “Black Swan”. “Birdboy” von Pedro Rivero und Alberto Vasquez. Birdboy and Little Dinki love each other. But, as facebook would say: it’s complicated. “Hand of God”, Rune Eriksson: The truth behind the hand of god. “The Origin of Creatures“, Floris Kaayk: In a post-apocalyptic world human spare parts build a babelesque tower. „Overnight Stay“, Daniela Sherer (Israel): An old women tells her story of a heartwarming night in 1941. „Die Kiste“, Kyra Buschor (Deutschland): Three frogs debate about a box yet unopened. Author Dora AsemwaldPosted on 05/04/2011 Categories cultureLeave a comment on ITFS: Birdboy, eyeballs and lots of virtual blood. Dora's Journal Create a free website or blog at WordPress.com.